The Santa Monica, California-based company is the creator of the nation’s most popular fitness and weight loss solutions. Beachbody® programs combine challenging DVD-based workouts with easy-to-follow diet guidelines, nutritional supplements (including its breakthrough health shake called Shakeology®, and the clinically proven 21-day cleanse known as the Ultimate Reset®, and an unparalleled customer service and peer-support system. In fact, Beachbody has expanded this support system through TeamBeachbody.com, which includes a network of thousands of independent “Coach” distributors as well as a dynamic online support and fitness community. The corporate mission is to help people achieve their goals and enjoy healthy, fulfilling lives. The explosive growth of the home fitness industry in recent years had been led, in a major part, by Beachbody. With the introduction in 2007 of their “Team Beachbody-Coaches”, a commission-based independent distributors network, product sales volume for the company skyrocketed. As a result, legacy technology platforms and associated systems were under significant strain to scale and the slowdowns in the availability of real-time customer data degraded their ability to effectively market and retain customers. Beachbody’s ability to keep their coach network as well as consumers supported and “happy” was at risk and was likely to pose a direct threat on their revenue. 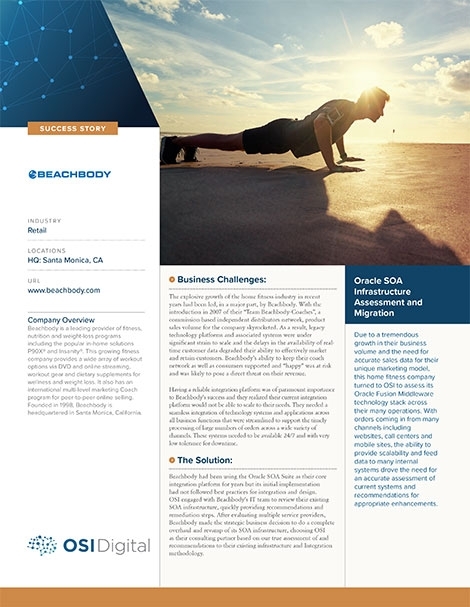 OSI Digital’s multi-shore team, an expert mix of architects, functional, technical and infrastructure resources trained on Beachbody’s business processes, developed and delivered a customized, multi-layered ‘Integration Assessment & Roadmap’ for Oracle SOA implementation and tuning. The proposed enterprise-wide integration included short-term, mid-term and long-term objectives, coordinated with Beachbody’s IT team. The work included infrastructure upgrades, high-availability and disaster recovery, the optimization of various SOA layers, and business process orchestration. This provided a seamless integration platform for the Beachbody IT team. OSI introduced various orchestration mechanisms for streamlining business processes such as sales order fulfillment which helped drive efficiencies for Beachbody. OSI’s integration experts have a track-record of providing successful end-to-end integration assessments, implementations of various systems and support services.